I seem to have gotten carried away with this concept of a long weekend and let it extend well into my Tuesday. Nothing really wrong with that at all. Yesterday was a wonderful Canada Day. I worked hard earlier in the week as I was determined to finish my wall hanging in time. And yes, it did hang proudly on my wall yesterday and will stay there until I make some other seasonal one to replace it. (in other words, it could be there quite a while). 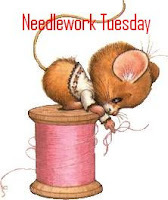 The pattern was designed by Heather at The Quilt Place in Shakespeare, Ontario. It measures approximately 10 x 28 inches. I have been studying quilting designs by Leah Day lately and used two of her motifs for the quilting. The white is Basic Spiral, and the red is Abstract Leaf. I have lots more quilt tops to experiment/practise on and there are so many lovely designs even in the beginner section. Quilters are some of the most generous people I know. 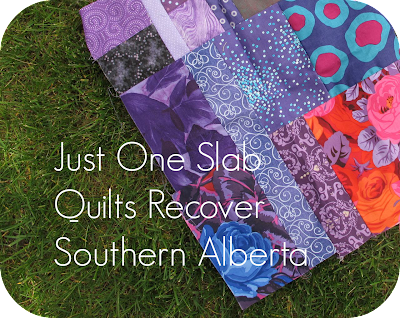 There are many individuals and groups that are making quilts for those who have lost their houses and belongings due to the massive flooding that has hit central Alberta in the past few weeks. While I am not in a position to complete and entire quilt, I certainly have the time to make at least one block. Designer Cheryl Arkison has offer collect blocks and assemble them into quilts. She has a whole bunch of long arm quilters ready and willing to do the quilting. Cheryl asked that you sew a 'slab block' 15 1/2 inches square and send it to her. She has the basics on her blog, but this is my attempt. I had been working on my Canada Day wall hanging, so happened to have out my bit of reds. It's not a log cabin block, but it does build out from the red and white centre. If you have the time, every block will be helpful . 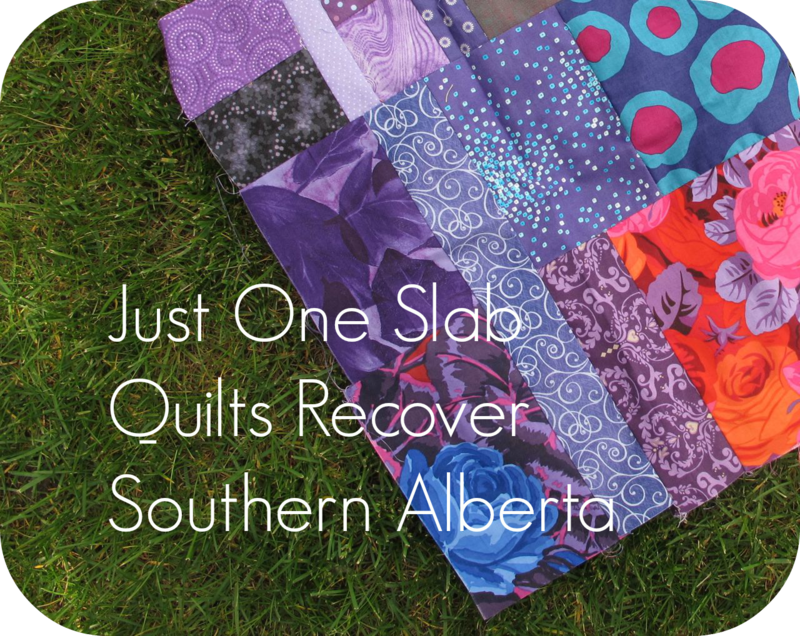 "Just One Slab Quilts Recover Southern Alberta"
I have several family members who were affected by this flood, and while they are ok, a lot of their friends and co-workers weren't so lucky. It's the least I can do to help. Back to my Saturday Morning quilt class. This past week, we did two months in one. The blocks were very similar so it made sense to combine them to one class. The BOM is by Sharyn Craig. This is month 5, "Plumb Line". Measures 9 1/2 inches. Month 6, "Hard Hat" also 9 1/2 inches. I got three more of my mini setting blocks finished. I decided to make the same block in three colour variations. much easier cutting and then piecing repeats. This is the easiest of the mini block patterns, so they went together quite well. These measure 5". TV watching time also gives me a chance to work on the salmon afghan for my sister. Seven more of these 5 inch blocks this week. Only need two more and then I can stitch together the strip and find out how long it measures. These stitch up rather quickly, though the double crochets in that centre loop are a bit vexing. I find that working with the chunk yarn is hard on my hands. I am using a standard skinny crochet hook. I wrapped some packing tape around it and then slipped a foamy pencil sleeve over it. It's now a bit thicker, but still not ideal. Has any one tried any of those thick handled crochet hooks? if so, what brand, and did you feel that it helped? Great work, Heather! I think crafters in general are a generous bunch. I love the "slab" blocks idea. And for such a good cause. I'll check out the instructions and see if I can contribute. I adore the Plumb Line block - the colors are gorgeous! Thanks for inspiring me as always.